On Monday, November 12, 2018, the addition and renovation project for St. Francis Elementary School (SFES) officially broke ground. 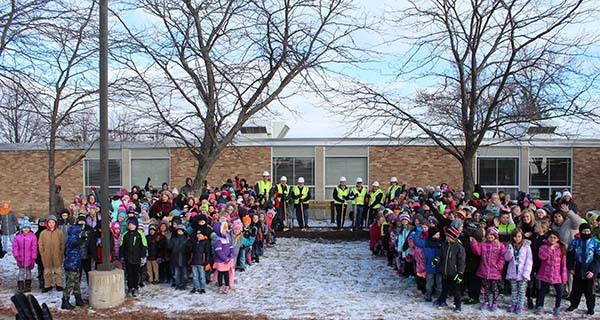 With hard hats and gold shovels in hand, District leadership, school board members, St. Francis city officials, staff and students celebrated an exciting start to this project. Led by Superintendent Troy Ferguson and SFES Principal Ryan Johnson, approximately 350 attended the "first dig" for in the district. The crowd included 14 SFES classes who bundled up to witness the ceremonial groundbreaking. Approved in November 2017 as part of the District's successful $80.06 million referendum, Building Our Future Together, this elementary school project focuses on enhancing educational spaces and improving physical facility needs such as safety and security. This is an exciting time for St. Francis Area Schools as this construction will support both current and future families. Components of this project include a 10-classroom addition, a new secured entrance, improvements to the facility's drop-off and pick-up zones, Media Center renovation to create a new commons area and physical facility improvements including mechanical, electrical and building envelope. Johnson said, "Once completed, the 'new' St. Francis Elementary School will be on its way into and beyond the 21st Century with a building befitting the world-class staff, students, and families we are so fortunate to have at our school." With substantial completion slated for August 2019, SFES will be able to continue to create an engaging learning environment for their students. "We are extremely thankful for the support from our community and stakeholders as we work on Building Our Future Together," Ferguson said. For updated information and progress on all District projects, visit www.isd15.org/bond.